It's been a while, but this hobbyist has not been idle. Coming off the warm-fuzzies of knowing that I'd worked through all the Mansions of Madness minis I have. I wanted to keep up the momentum. Slightly hindered by some business travel, I have still had an amazingly productive 2 weeks. 62 minis worth of productive in fact! I currently have 168 Descent monsters, so I've painted more than 1/3 of them in two weeks which feels great. 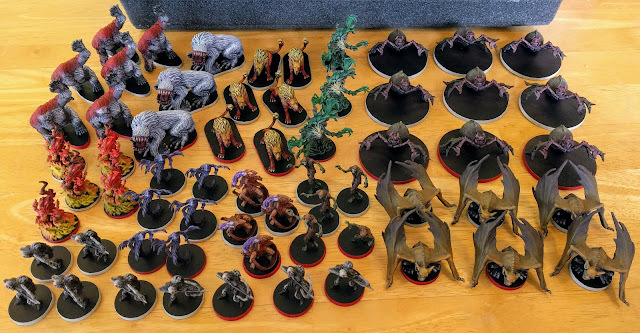 Of course, as with the Mansions of Madness, I'd done all the prep and some fairly extensive airbrushing work to get a jump start on them. Best of all at 296 minis for the year so far - I'm ahead of my mini/day average at this point! I haven't really been taking the time to get step by steps on these models, but one of the things that I have been using these models to practice is drybrushing. Although the models lack detail, the detail they have is often quite exaggerated to make sure it carries in the casting process. Drybrushing is a technique I've always struggled with... mostly because I'm impatient - I want to get the paint down as fast as possible. 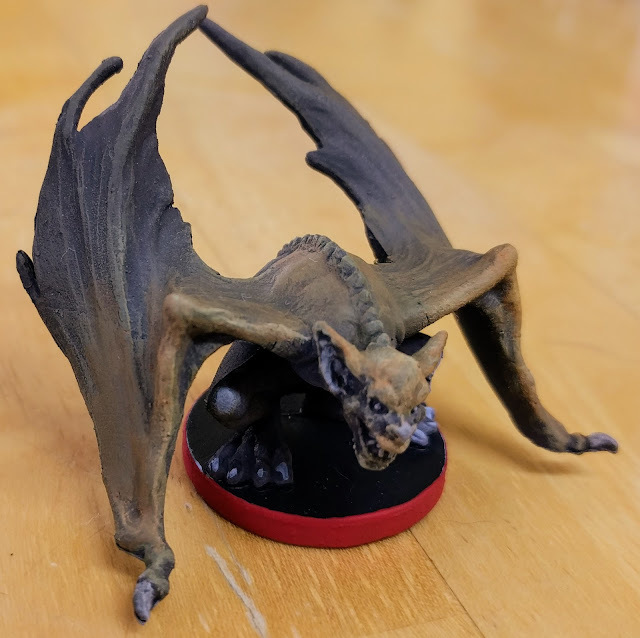 This Razorwing provides a great example of what can be done with drybrushing (and also shows some of my flaws with the technique). 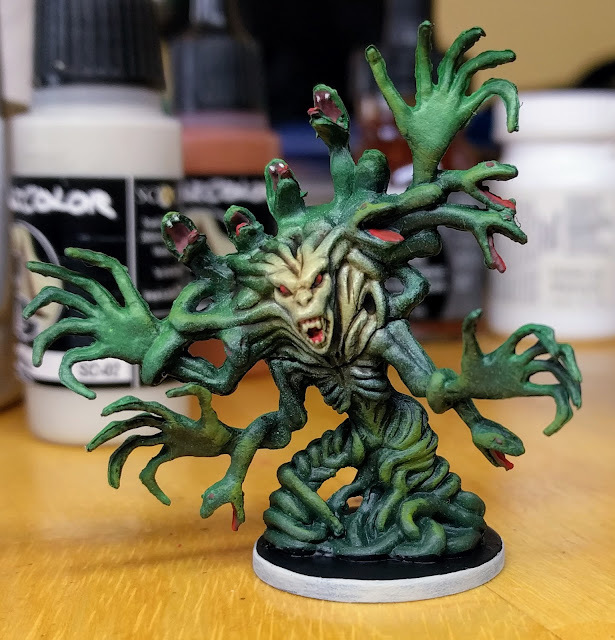 I don't have photos of the various steps but it was a pretty straight forward process with a focus on maximising contrast to help the figure pop at a distance while worrying less about smooth blends and transitions. Drybrushing front edges and head ScaleColor Orange Leather - this is a more limited drybrush although as you can see on the head, I laid it down a little too heavily at times. The greys use ScaleColor Artic Blue to pick out details like ears, nose and knees. Drybrushing is notorious for giving a 'dusty' particulate finish rather than the smooth buttery transitions that are generally loved by competition painters. There are situations where drybrushing can be useful and the effect can actually be beneficial - Terrain is the most common use, also dried mud on cloaks and the like. I also love drybrushing for bones and short haired fur like the razorwing above. The dust gives a good sense of texture, quickly. The dusty look of drybrushing can also be mitigated somewhat with a glaze over the top. 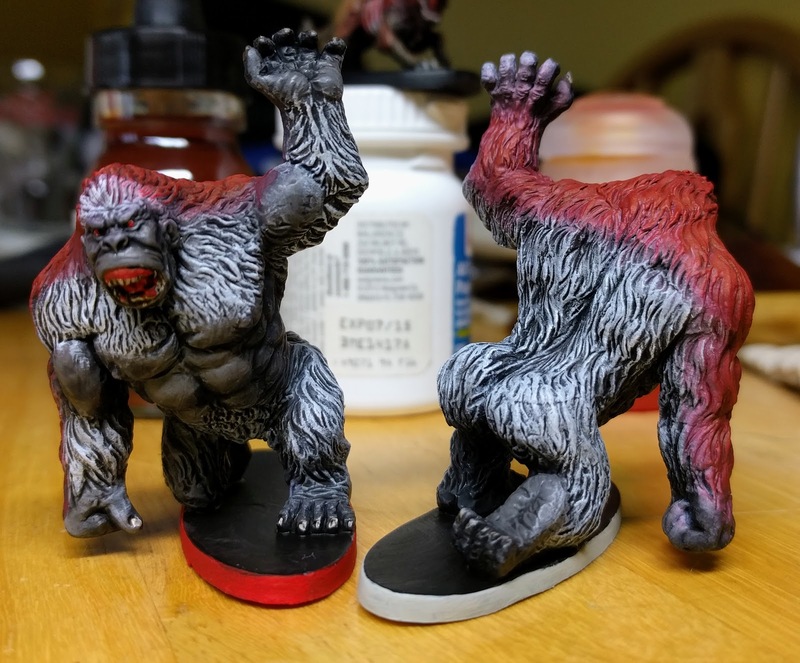 This is a useful technique for smoothing a lot of blending sins, not just drybrushing. You an see an example in the Medusa model above. 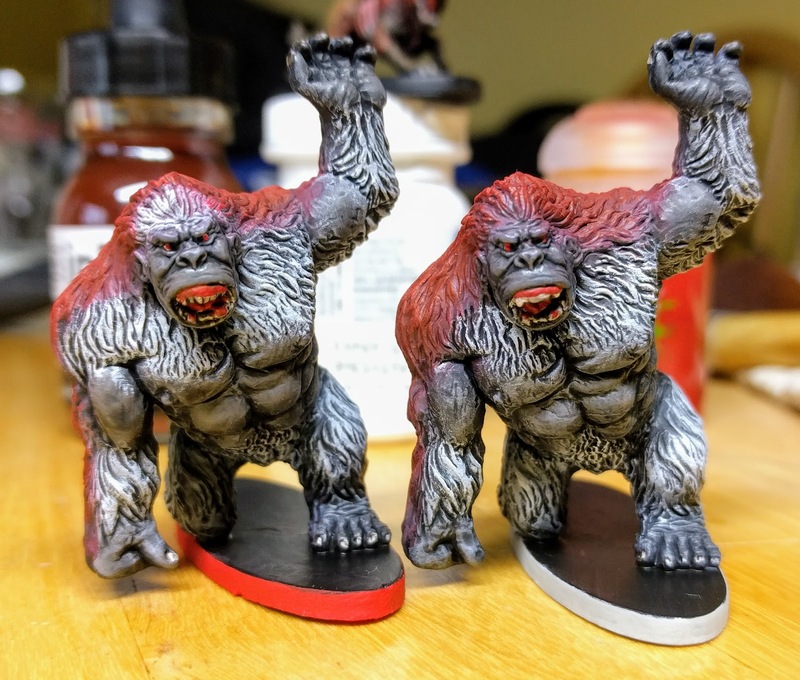 At the request of Reddit user doctorocelot here are some close ups of the Blood Apes (aka 'Those oragutan type beasts'). These guys really benefit from the exaggerated texturing that made drybrushing super easy. I've also really pushed the contrast here and it shows, helps them pop at a distance and gives them more vibrancy... on the flip side - the drybrushing is not my best with some lumpy paint and some brush strokes showing.